You are here: Home » About » What Causes Florida Hurricanes? Hurricanes are created by intense areas of low pressure that form over warm waters in the ocean. In the China Sea and the Philippines these fearsome storms are known as typhoons. They normally occur during the summer and beginning of the fall. Water vapor is the energy source for Florida hurricanes. This water vapor fuels tropical storms to turn into hurricanes. Low pressure causes these storms to spiral in a circular motion, further strengthening them. South of the equator storms circle clockwise and north of the equator they circle counterclockwise. The spiraling motion and carrying winds help these storms to increase in size and intensity as they travel across the ocean. The outer bands continue to feed the storm and create an eye wall at the center of the hurricane which can be miles wide. On average hurricanes measure approximately 311 miles in diameter. However the eye wall is where the strongest winds are. Though the eye itself often creates no damage and planes can even fly in it to take pictures. The intensity of hurricanes is measured by the highest sustained winds, based on a one minute average. Florida hurricane strength is measured using the Saffir-Simpson scale, rating storms on a scale of 1 to 5 with 5 causing the most damage. Even a category one hurricane can cause major damage and loss of life as evidenced by hurricane Noel in 2007 which caused $742 million in damage and left 163 dead as well as 59 missing. Florida hurricanes and tropical storms normally begin off the coast of Africa near the Cape Verde Islands and are carried westward. They then often gain strength and speed over the ocean until making landfall, whether it is on Florida’s east or west coast or passing through to the south and Gulf of Mexico. 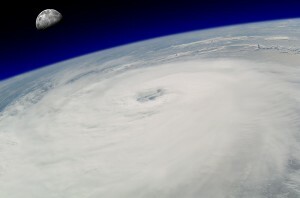 Forecasters like Colorado State University and the NOAA begin making predictions for the following year around December and then generally issues several updates as Florida hurricane season approaches. While meteorologists now have many more tools for monitoring weather from Doppler radar to satellite images it can still be much more of an art than a science. Predictions are just for approximate activity during a hurricane season and cannot be accurately used for forecasting specific storms and dates. When it comes to forecasting hurricane routes things are much easier and the National Hurricane Center currently uses two models; the United States Navy Operational Global Atmospheric Predictions Systems and the United Kingdom Meteorological Office’s global model. The NHC issues predictions on hurricane routes as they approach Florida and 12 hour, 24 hour, 48 hour, 72 hour, 96 hour and 120 hour forecasts. The closer the hurricane is the more accurate the predictions.